It’s all in the image – well, at least 90 percent anyway. Many radiologists will contend that optimum image quality and accurate diagnosis are directly related. Along this line of thought, healthcare has invested heavily in imaging equipment and software with higher grayscale contrast and more megapixels to render a sharper image. The use of multislice CT scanners has exploded in the last few years in an effort to capture greater anatomical detail. All of this has been geared toward enhancing clinical images to improve accuracy in diagnosis. As Imaging Technology News (ITN) also strives to optimize clarity and accuracy in its coverage of medical imaging technologies and their clinical applications, it has focused its own lens and has projected a new vision of imaging on the home page of its relaunched Web site – www.ITNonline.net. The new site is straightforward and concise from the minute you hit enter. Front and center on ITN’s Home page are the product shots and detailed information on the most recently FDA-approved modalities and IT solutions to hit the market in the “Late Breaking Products” section. 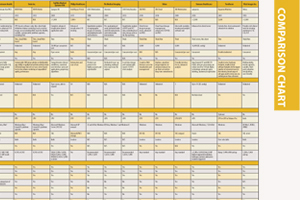 ITN’s trademark product comparison charts lay out the technical specifications you and your hospital need to know before purchasing new capital equipment – just click “Comparison Charts” on the toolbar. You can reference relevant technology at a glance in ITN’s comprehensive “Technology Database.” Find contact information and corporate profiles on all of the leading vendors in the industry, plus a complete list of their products and services in ITN’s extensive “Buyer’s Guide.” We keep readers up-to-date by posting daily news in “Making Headlines” and with our current issue accessible on the Home page. And we back up everything we put in print in ITN’s digital archives, which go in depth, providing previous articles, product spotlights and news for your own personal research. The beauty of the site is its ease of navigation, mapping out for the reader a clear picture of medical imaging and embracing one of the visions of radiology – the clearer the image, the greater the accuracy.